^ d'Albe, E. E. F. (1 July 1914). "On a Type-Reading Optophone". Proceedings of the Royal Society A: Mathematical, Physical and Engineering Sciences. 90 (619): 373–375. Bibcode:1914RSPSA..90..373D. doi:10.1098/rspa.1914.0061. ^ "Extracting text from images using OCR on Android". 27 June 2015. ^ "[Tutorial] OCR on Google Glass". 23 October 2014. ^ PrintToBraille Tool. "ocr-gui-frontend". MILE Lab, Dept of EE, IISc. Archived from the original on December 25, 2014. Retrieved 7 December 2014. ^ "How To Crack Captchas". andrewt.net. 2006-06-28. Retrieved 2013-06-16. ^ "Breaking a Visual CAPTCHA". Cs.sfu.ca. 2002-12-10. Retrieved 2013-06-16. 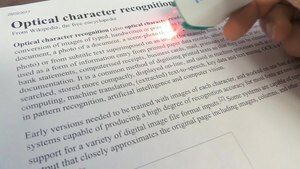 ^ a b "Optical Character Recognition (OCR) – How it works". Nicomsoft.com. Retrieved 2013-06-16. ^ Sezgin, Mehmet; Sankur, Bulent (2004). "Survey over image thresholding techniques and quantitative performance evaluation" (PDF). Journal of Electronic Imaging. 13 (1): 146. Bibcode:2004JEI....13..146S. doi:10.1117/1.1631315. Retrieved 2 May 2015. ^ Gupta, Maya R.; Jacobson, Nathaniel P.; Garcia, Eric K. (2007). "OCR binarisation and image pre-processing for searching historical documents" (PDF). Pattern Recognition. 40 (2): 389. doi:10.1016/j.patcog.2006.04.043. Retrieved 2 May 2015. ^ Trier, Oeivind Due; Jain, Anil K. (1995). "Goal-directed evaluation of binarisation methods" (PDF). IEEE Transactions on Pattern Analysis and Machine Intelligence. 17 (12): 1191–1201. doi:10.1109/34.476511. Retrieved 2 May 2015. ^ Milyaev, Sergey; Barinova, Olga; Novikova, Tatiana; Kohli, Pushmeet; Lempitsky, Victor (2013). "Image binarisation for end-to-end text understanding in natural images" (PDF). Document Analysis and Recognition (ICDAR) 2013. 12th International Conference on. Retrieved 2 May 2015. ^ Pati, P.B. ; Ramakrishnan, A.G. (1987-05-29). "Word Level Multi-script Identification". Pattern Recognition Letters. 29 (9): 1218–1229. doi:10.1016/j.patrec.2008.01.027. ^ "Basic OCR in OpenCV | Damiles". Blog.damiles.com. 2008-11-20. Retrieved 2013-06-16. ^ a b c Ray Smith (2007). "An Overview of the Tesseract OCR Engine" (PDF). Retrieved 2013-05-23. ^ "OCR Introduction". Dataid.com. Retrieved 2013-06-16. ^ "How OCR Software Works". OCRWizard. Retrieved 2013-06-16. ^ "The basic pattern recognition and classification with openCV | Damiles". Blog.damiles.com. 2008-11-14. Retrieved 2013-06-16. ^ a b c "How does OCR document scanning work?". Explain that Stuff. 2012-01-30. Retrieved 2013-06-16. ^ "What is the point of an online interactive OCR text editor? - Fenno-Ugrica". 2014-02-21. ^ Riedl, C.; Zanibbi, R.; Hearst, M. A.; Zhu, S.; Menietti, M.; Crusan, J.; Metelsky, I.; Lakhani, K. (20 February 2016). "Detecting Figures and Part Labels in Patents: Competition-Based Development of Image Processing Algorithms". International Journal on Document Analysis and Recognition. 19 (2): 155. arXiv:1410.6751. doi:10.1007/s10032-016-0260-8. ^ Holley, Rose (April 2009). "How Good Can It Get? Analysing and Improving OCR Accuracy in Large Scale Historic Newspaper Digitisation Programs". D-Lib Magazine. Retrieved 5 January 2014. ^ Suen, C.Y. ; Plamondon, R.; Tappert, A.; Thomassen, A.; Ward, J.R.; Yamamoto, K. (1987-05-29). Future Challenges in Handwriting and Computer Applications. 3rd International Symposium on Handwriting and Computer Applications, Montreal, May 29, 1987. Retrieved 2008-10-03.